Former Sri Lanka National Cricket team analyst Sanath Jayasundara, who was employed at the SLC Brain Center, has been sent on compulsory leave by the SLC on alleged corruption charges, SLC CEO Ashley de Silva confirmed. “We have received a complaint regarding him from the ICC Anti–corruption Unit. Hence, we have taken this decision,” said de Silva, who refused to make any further comments as the inquiry is ongoing. Jayasundara has been employed at SLC for more than 15 years including a long tenure as the National Team’s video analyst before he was assigned to the SLC Brain Center at R. Premadasa Stadium. 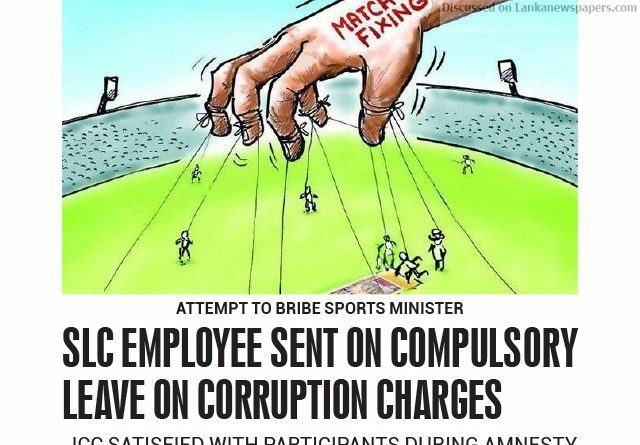 A few days ago Sports Minister Harin Fernando disclosed that he had been offered a bribe to include certain players in the National Team, and he had immediately made a complaint to the ICC Anti-Corruption Unit. Ceylon Today learns Jayasundara has been accused of offering the said bribe on behalf of a spin bowling all-rounder to be included in the team, and has now to face the consequences. The ICC earlier announced a 15-day amnesty from 16-31 January to participants who had previously failed to report any information concerning corrupt conduct in Sri Lankan cricket. The announcement of the amnesty came just a week after Sri Lanka was rated as the most corrupt cricket nation by the world governing body, as Sri Lanka had faced several issues relating to corruption, including pitch fixing charges, brought by Qatar based TV station Al Jazeera. “ICC feels corruption at SLC has gone beyond just corruption and has links to the underworld,” said Minister Fernando after he made a visit to Dubai to meet Alex Marshal, the General Manager of the Anti-Corruption Unit. I would urge any more players or participants who have any information concerning corrupt conduct to come forward over the next week and share it with us in the strictest of confidence without any fear of repercussions,” said Alex Marshal in a statement yesterday. Last year three ex Sri Lankan Cricketers were charged by ICC for violation anti-corruption code. Dilhara Lokuhettige was the last to be charged and was suspended for corruption during a limited over league match in 2017. Former paceman Nuwan Zoysa was suspended over match-fixing accusations, while former skipper and ex-Chief of Selectors Sanath Jayasuriya was charged for failing to cooperate with a match-fixing probe and concealing information.